Marni Boppart became interested in the cellular adaptations that occur during exercise as an exercise physiologist in the United States Air Force. After completing her doctoral degree in applied anatomy and physiology at Boston University, she joined the Department of Cell and Developmental Biology at the University of Illinois, first as a postdoctoral research associate and later as a research assistant professor. She joined the Department of Kinesiology and Community Health in 2007. During exercise, muscles perform both concentric, or shortening contractions, and eccentric, or lengthening contractions. The eccentric contractions injure the muscle, which responds by regenerating and subsequently enlarging. Dr. Boppart's early research examined the effect of eccentric contractions on muscle at the cellular level, and has since addressed the role of the α7 integrin, an adhesion molecule, in restoring muscle size and function. She found that eccentric contractions increase α7 integrin protein expression, and that the α7 integrin can protect against further injury while increasing fiber size. In the pursuit of further understanding of the repair process that takes place in muscle, Dr. Boppart is investigating the contribution of stem cells. She recently received a grant from the Ellison Medical Foundation to study the role of mesenchymal stem cells (MSCs) in preventing sarcopenia, the natural muscle atrophy that occurs with aging. Her research showed that age decreases MSCs, which are found in bone marrow and a variety of adult tissues, but that a combination of the α7 integrin protein and exercise could restore the presence of the cells in skeletal muscle. They have since further characterized the MSCs as pericytes that also have the ability to enhance new vessel growth in response to exercise. 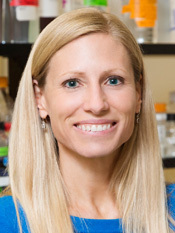 Dr. Boppart and her research associates are currently developing new interventions that will optimize the ability for pericytes to increase skeletal muscle growth and ultimately combat age-related sarcopenia. "Our ability to move and maintain muscle mass is directly related to prevention of disease, Dr. Boppart said, so limiting muscle deterioration is a key factor to living a longer life and enhancing the quality of the years as we age. While one cannot completely prevent the process of muscle degradation, Dr. Boppart is determined to find a way to slow the process down.